A stranded puppy sits in the rain. Don't worry, though: He's saved by horses. After years in which the themes of Super Bowl ads seemed to be bikinis, high jinks and crude things happening to old people, what a surprise to find out that Sunday night, the theme was feelings. Not regular feelings like the ones you have when something actually happens to you, but the feelings you have when, say, large companies pay millions of dollars to try to generate whatever emotional pull they can in 30 or 60 seconds. 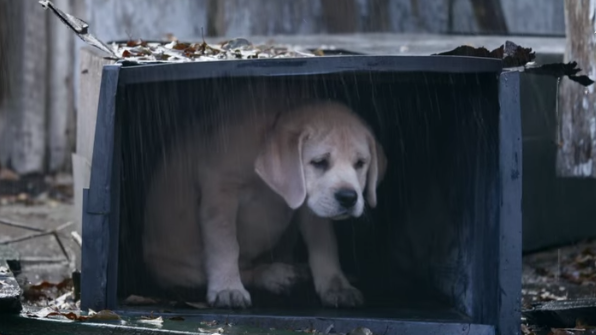 Budweiser's most sentimental ad feels like it was sketched out in a brainstorming session that went: "Let's make it about a dog." "Who gets lost." "And then a wolf tries to eat him." "But then he's saved!" "BY HORSES!" "Hey, can we get a nice cover of that song where the guy goes 'da-da-da-da!' 'da-da-da-da! ', only it sounds like somebody is dying on the operating table on Grey's Anatomy?" Of course, this wasn't the only stuff on display — Budweiser's other ad was an attempt to give energetic noogies to microbrew culture and then throw it in a locker by pointing out that Budweiser is a beer-like beer for beer drinkers who like to drink beer. It's just beer, OK? BEER. But a lot of these ads were precisely for people who like their beer fancy and their hankies absorbent. Dads got a particularly powerful dose of onion-chopping delivered directly to their mucous membranes: a dad driving his daughter to join the military, a dad who's sort of estranged from his son, and then there's a Nissan involved for some reason, and a Dove ad about caring dads all explicitly carried the message: "Your dad has feelings, and if you are a dad, we know you have feelings also." Among all these salutes to boyhood and dad-hood, there was one ad explicitly aimed at feelings surrounding women and girls: an Always ad riffing very effectively on the idea of "run like a girl" and "throw like a girl." Some of the ads about feelings, however, weren't merely maudlin but were actively dark — most notably one from Nationwide in which a cute kid waited until the end of the ad to tell you that he was dead. Possibly, the ad implied, because he drowned in a tub or was crushed by a falling television. With all the jockeying for attention, perhaps somebody finally got to the point where they thought, "You know what would get people talking in this social media age? A gigantic bummer about drowning in the middle of the Super Bowl." There were still ads that felt like the Super Bowl ads we know — Pete Rose made jokes about being in "the hall" (of his house!) for Skechers; Bryan Cranston dressed as Walter White, and Lindsay Lohan the person dressed as Lindsay Lohan the tabloid celebrity, both stars doing riffs on their own images for Esurance; and, in a moment that was actually kinda cute, Bryant Gumbel and Katie Couric expanded on their now-legendary clueless discussion of the nascent Internet many years ago. Crass as it is, advertising tells you something important that's pure and straightforward: It tells you what advertisers think people will pay attention to. Perhaps the very fact that, as Coke was kind enough to tell us, we live in an age of vicious public conversation means that this year, the most attention-getting maneuver for your zillion-dollar ad was presumed to be the ice-cold monetization of people's humanity. Do you like kids? Dogs? Horses? Dads? The military? The outdoors? That's OK, we know, we hear you, they whisper seductively. But don't drink beer for wimps.